This article is about the Adventurers Egypt minifigure. For the main antagonist of the Adventurers theme, see Lord Sam Sinister. Slyboots, initially known as Sam Sinister in North America, was a villain in Adventurers Egypt theme. He was the partner of Baron von Barron. Both of them were out to follow Johnny Thunder and get the treasure for their own uses before he could. Slyboot's personality was never expanded on much, and he dropped out of set releases after Egypt, with Baron von Barron becoming the main villain. However, he still appeared regularly in video games and other Adventurers media. When the Dino Island theme was released, Slyboots' North American name, Sam Sinister, was given to Baron von Barron, and his formerly exclusive European name, Slyboots, became his standard North American name. However, despite this, some media such as Soccer Mania still referred to him as Sam Sinister. When Orient Expedition was released, Sam Sinister donned a new outfit which seemed to combine element from his original and Slyboots'. This whole situation has caused much confusion, leading to LEGO joking about it in the bio of the Detective. 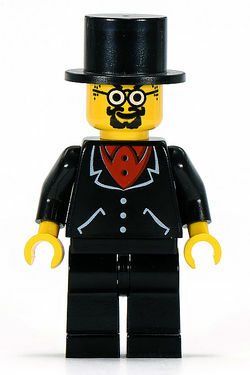 Slyboots appeared in LEGO Racers as Sam Sinister and LEGO Racers 2 as Slyboots (since Racers 2 took place after the name swap). He was also the goalkeeper of the Adventurers Villains team and also an out-field player in the Intergalactic team in the video game Soccer Mania; yet in this game, he is referred to as Sam Sinister, despite it being after the name swap. Slyboots appears in five sets, but disappears after the Egypt subtheme. This page was last edited on 20 November 2018, at 18:18.